"A Comprehensive Manual to Pick Up Artistry (Mystery's Upgraded Method)"
At $100 this is expensive for an ebook. It's also a bit dated, having been published in 2008 (6 years ago). However it does contain good quality advice. If you are ambitious in your aspirations of the quality (beauty) of girls you want in your life, or in building your skillset to work in bars and clubs, this book provides comprehensive advice on how to get there. Important Update: In 2013 a more comprehensive course came out, that is a direct evolution of the mystery method system - 3 Second Sexual Attraction 2.0 from Mehow. It has more comprehensive content which includes infield videos with demonstrations. Finally - if you are new to dating advice and haven't read any before this isn't for you. First read the the best beginner's book on the market: Make Women Want You to get your dating skills started. This book was the third evolution of the Mystery Method from Mystery (Erik von Markvoik). For background check out the complete evolution of Mystery Method courses in this summary Evolution of The Mystery Method and read our review of the former edition of Mystery Method. This book was a surprise to me. I expected simply an upgraded version of The Mystery Method: How To Get Beautiful Women into Bed, but it turned out to be quite a bit more. Revelation was extended beyond Mystery's original Mystery Method (MM) for picking up women to ensure that it was more comprehensive. The original Mystery Method (MM) included: The M3 structured model, Group theory, Gambits and a Methodology for practicing in field (actually just a few principles). -	The Zen of Cool: The most fluid and easily understood explanation of how good inner game comes across that I have ever read. -	Delivery of Material and Lines: Lots of subtleties pointed out that held people back from implementing the original Mystery Method. -	Making Conversation: Same as above, lots of subtleties described well to help people to understand their importance and how to make this pick up approach really work. Revelation integrates many essential concepts that have grown up out of the community over time into Mystery Method, thereby making something much much more effective. It is done very well, and details from concepts taken from elsewhere flow throughout the book seamlessly, interwoven with Mystery’s concepts perfectly. Some of these include: Attainability/ appreciation from Sebastian of The Approach, reactivity, secret society and AMOG concepts from Real Social Dynamics, vibing concepts that surfaced in the community during 2006, ‘entourage’ from AFC Adam (Adam Lyons) and company circa 2007 and many more. I was most impressed to see the integration of some aspects of the game that I’ve found important, subtleties that I’ve integrated over the years, but that have been less talked about outside of the older hands of the community who keep more to themselves. I’ve never seen this written before and was impressed. It goes against a lot of the seduction community ’dogma’ that has unfortunately arisen over the years, and has been detrimental to the development of many students. The book places important emphasis on “Healthy emotional programming – sincerity, kindness, ambition, industriousness, love and commitment, protector of love ones etc.” This is an innovative way to explain and convey important character traits that you should be taking on and why. Great stuff again. The last chapter's review of plausible deniability, social norms and ASD is the best well rounded explanation I have seen anywhere of how to pull your game together fully. It will be very useful for anyone from beginners to advanced. My fear is that the wealth of information may be overwhelming for beginners. This is not through fault of good explanation, but more through the sheer overwhelming amount of content that is contained within this product. Mystery’s Method has always been the most complex, and this, while making it more accessible and simple on some levels, remains complex due to its sheer comprehensivity. Some of the concepts may be difficult for newbies and beginners to understand. It is extremely comprehensive. And some of the concepts get less attention from others. Explanations should have been improved on some of the discussion of plausible deniability, serendipity and baiting with more examples for instance. For beginners or those who have studied less, these concepts will be difficult to implement due to lack of understanding. Other weaknesses include are the price and customer service. The price, at $99 for an ebook, is right at the top end of the range. Customer service also tends to be challenging. We've received various reports from customers having difficulty getting in contact with their support. 3 Second Sexual Attraction is the second evolution of Mehow's system. Mehow trained initially with Mystery and later on went into a lot more detail with his system. In the second version of his system, he has again gone into more comprehensive detail, so that it is more practical than former Mystery Method systems (including Revelation and Magic Bullets). A key aspect of this is that he explains and describes the conversation pieces and elements you use in far more detail. In addition he includes real infield footage in the course, to show you what it looks like when executed. The price is also more reasonable compared to Revelation - especially given the much larger range of books, audio and videos you get with this most recent course. As a result it is currently the best Mystery Method based course available. See our complete review here. Magic Bullets is the competing product from Love Systems which is very similar in its base content. Where the two differ, is that Revelation has attempted to include more content from the softer side (e.g. Inner game) into its method. Whilst Magic Bullets remains technical, but has expanded further the original MM to handle more contexts/ situations and approaches. This product has a slight edge over Magic Bullets in content quality, thanks to integrating a wider range of perspectives on the art of pick up (e.g. plausible deniability and inner game concepts). It also maintains an 'arty' feel to it, which is Mystery's style. If you like to learn through more general concepts as opposed to technical/ detail orientated rules, you are likely to find this product better suited to your learning style than Magic Bullets. On the other hand, Magic Bullets, thanks to the detail it goes into tends to be easier to implement than Revelation. This is the main reason it has a higher rating than Revelation. This product is a little pricy at just under 100 dollars for an eBook, but in content terms it's pretty polished. It is the most comprehensive look at Mystery's art of pick up, approaching and attracting women, weighing in at over 300 pages. So you get a lot of content for that money. The more recent and comprehensive course, 3 Second Sexual Attraction 2.0 from Mehow, covers the same contents in more detail and more comprehensively - and is cheaper. It's the best version of the Mystery Method systems currently available. Nonetheless we recommend Mystery Method courses only for the intermediate to advanced students of dating advice (i.e. you are already getting good results), because of their complexity. If you are new to dating knowledge, instead check out a practical and more easily implemented course like Make Women Want You. Finally, for people in the seduction community for a while who haven’t been getting the results they want, perhaps through attempting to implement the original MM (Mystery Method), I would recommend The 4 Elements of Game which is the best run down of how to fix the problems you have and start getting results. This program reveals practical emphasis on vibe, delivery, humor, microcalibration, and value switches that could assist you in capturing the attention of women. The manual is a more recent publication that has its origins traced in the original Mystery Method Corporation eBook (The Venusian Arts Handbook), which Mystery Method Corporation formerly published before Mystery left and it changed its company name to Love Systems. 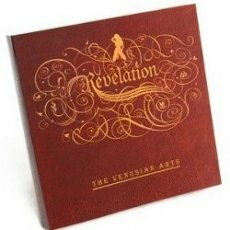 "Hands down - "Revelation" is a great book." Hands down - "Revelation" is a great book. I would recommend it to everyone who's searching for a complete guide to improve your game with women. Lovedrop did a great job putting all the stuff together. The book is easy to understand and full of examples. The ghost & the flame concept is great...Lovedrop's style is writing is straight to the point - that's by the way why I didn't like Matador's chapter "The way of being" that much - although there are some good points, I didn't like the brief explanations of concepts like "Good manners", "Good Listener" etc. - all suggestions like "you must be this, you must be that" without any examples... The "disinterest" chapter is great, with many examples, so is "sound bites" and "Women explained" by Hitori and the AMOG-chapter. Final note: 300 pages full of great advice. The book is more than worth the money. In contrast to other guides that focus on theory too much, "Revelation" has examples that you can use in field and that really work. I am so lucky to have read this book. I am a huge fan of the movement. So i had read The Mystery Method then Magic Bullets soon after i became a fanatic of Mystery's VH1 series. I am far from a master but far from a beginner. With that said, this book, blows anything i have read or seen out of the water. It digs deep down to make things click, and hits every area with intensity. It covers everything! Matadors "Zen of Cool" in addition to Lovedrops nuggets of knowledge about humor and persona are priceless. They take the game to a new level and tackle everything in a easy way to understand and read. This book is full of useufll insight more than usefull examples, however it does include usefull examples! This book, from my perspective, aimed to reach people on a different level, it aimed to teach you how to develop inner game. It aimed to show you that the game is not a formula for getting girls, rather a formula for getting the life you want. I am so inspired and gratefull, words cannot adequatly express my appreciation in words. So, THANK YOU!!! "My Inner Game Boosted Out Crazy." I felt like way better as soon as I downloaded the book, just because of the expectations I had from the book. It's psychological you know. It's not like you know any of the book but my inner game boosted out crazy. I tell you I went all crazy as soon as I read that little page about "Social Superpowers", was that page 3? I just went out of the house and did lots of incredible things, just smashed through all my fears. But it was my mind mostly that did the trick. And Mystery, Matador and Lovedrop's book is presented in such a way as to stimulate such reactions. As soon as I saw the design of the book I thought "OMG, this looks more like a Dungeons and Dragons Guide, and I rememberd reading about Mystery being a pre-PUA D&D nerd or something. So I thought gee, to him all this is just like a videogame, it's like, when you play on your computer, yeah you do get a lot of emotions, but you don't actually feel anxiety when some "in-game social situation" is aukward. I just don't care, you don't react to NPCs the way you react to live people. I thought of this as the right mindset, a mind set of.. curiosity, in a place, the world, you need to explore, find out it's secrets, and tricks to win the game. Like a detached observator. This was huge and I had only read like 3 pages. For real! Oh, and the best parts are about The Zen Of cool, kino Plowing, understanding ASD, sound bites, microcalibration and the article written by the asian girl(what was the name?H...). Comes to think every piece of it was just as inspiring.. let me think.. The Way Of Being by Matador? HUGE! "This book will change your life, but only with time and effort." The only reason I set ease of implementation as 8 is because it will take a while for you to master the things found in this book, but take my word for it, if you put in the effort and commitment to really learning this stuff and not just try it this week and then give up because you didn't get the girls number- if you make it a point to practice the attitudes, tips, and techniques in this book for the long haul, I do not see how you will not turn into a guy who has women in his life at all times. You see, most people want a quick fix. They want some pickup line that works, or some routine that does the job like a magic spell and that is how I was at the beginning, but I have learned that with everything in life, you must put in time and effort into something in order to truly master it. Whether it is Judo, Basketball, or anything else, you will never master it unless you do it over and over and over AND OVER until you don't even have to think about it- until that is just who you are and how you are on the inside. I had been searching for this book ever since 2009. That was when I started getting interested in learning some techniques with girls because I knew I was doing something wrong, but I didn't know what. I bought ebook after ebook, but I never found the answer. Hell, even though the Mystery Method helped me in the sense that I eliminated some of the mistakes I was making, it wasn't helping me grow. I didn't want to practice routines at all because I felt so unnatural doing them. However, when I discovered that Mystery and Co. had written another book, I directly jumped at the opportunity to get it, and I'm telling you, this book will change the kind of person you are in that it will allow you to express your OWN personality in the best way possible. It will free you from your mental prison, and I absolutely recommend this book to every guy out there who not only wants to get girls, but also wants to become a happier individual overall. "Awesome Book... Every Single PUA should read!" Awesome Book... Every Single PUA should read! You can go through a structured game that is indirect (such as MM), go through a structured game that is direct (such as Jeremy Soul's method presented in Daytime Dating), you can go through not structured ways of game, being direct (such as Simple Pickup do) or indirect (which many ones call "Natural game"). It doesn't matter... There are always identifiable different moments in the interaction. Recognizing them, even if you don't think about it is a sine qua non skill for any PUA. Not all the men know this instinctively and apply it. In this case, the first step is to learn this concsciously. Even if you don't intend to apply indirect MM, this book will teach you this. "Overall, the Product is an Essential Reading." I think what's written in Revelation is knowledge that all people should have and take the time to learn regarding social dynamics. I've listened to the CD's and watched the DVD's pretty thoroughly. For me, the biggest things I have taken and begun integrating into my sarges (and every day life) are the Yin Yang mindset of "being the Ghost" and "being the Flame". Since learning the principles discussed in Revelation I've witnessed how 'needy' my thoughts, feelings, and behaviors have been in social situations in the past. SO...thanks to the book I am now learning how important it is to Add Value to interactions, use body language to make sure people do not feel threatened by my approach (common courtesy), and just basically being playful, fun, and interesting. Overall, the product is essential reading. It's one thing to read and learn all about this stuff and it's another thing to actually go out regularly and practice it. So, I make a point to literally go out as much as I can...even if it's for one beer at the local pub.